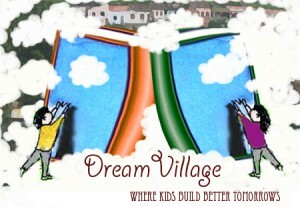 You are here: Home / Emerging trends & STEM / Treat Suneet By Voting for Dream Village TODAY At IdeaBlob! Suneet Bahtt of Social Symmetry should consider partnering with them since Dream Village is in the 24 hour final voting countdown at Ideablob and it’s a perfect like-minded ally! Vote NOW to help Dream Village Kids’ Books come to life! Dream Village creates kids’ books with a socially responsible twist, tied to an interactive element that enables children to affect change firsthand, chooseb where book proceeds will route, and feel the fulfillment of helping other kids overcome adversity! By using true tales told from the perspective of a child directly affected by various social, economic, & environmental issues (e.g. African water shortages, subpar resources in rural/inner city American schools, etc.) Dream Village uses peer to peer outreach placing kids metaphorically “in their shoes” so they can relate directly and champion change. Dream Village has already partnered with their first nonprofit, PlayPumps International, (we LOVE the Global Water cause here at Shaping Youth!) and their first book has been written, storyboarded and web portal for interactivity sketched…They just need the votes for the seed money to bring it all to fruition. A quick click TODAY will give ’em a great treat this Halloween! All three of these sites use informal discovery, play, chat, and techno media magic to make a difference in the REAL world offline, off screen, and outdoors! Dream Village could even be considered a low key, offline book reflection of a similar concept…You’re ALL on MY “dream team” shaping the vision of youth into a future generation of “catalyst kids” eager to make a difference in playful, fun, fresh ways! Encore! Elf Island (trailer below just to get you jazzed) opens the door to an entirely new genre of “Gaming for Good” (TM) with its whole mission being the notion of turning online efforts into offline tangible results! Kids are rewarded by witnessing photos, videos, and kids like themselves benefiting from the change they’ve affected by their virtual world actions. No simulation, folks. Real world change, via the nonprofit partnerships. “It’s all good.” 😉 Which reminds me…I need to see if Andre or Beth can Twitter these two treats pronto while I go get my Halloween munchkin captured on cam…Happy Halloween all! Vote on IdeaBlob for Dream Village NOW! p.s. Apologies to any IdeaBlobbers I may have overlooked by selecting to support Dream Village, but being a writer, books are a passion, and the outreach came from my Social Issue Games listserve, so I’m keeping this one all in the family/community this round! Elf Island Trailer: All Aboard! Beta Testing Opens On Nov. 4, Tuesday!! Elections, Elf Island, & GNO on Tuesday – it’s going to be wild, crazy, and all good! Tweeting & Stumbling. Make sure you check out emeraldisland.com – its another eco-conscious virtual world 😉 Just launched yesterday. And I WILL BE SEEING YOU at the Unconference next week. WOOT WOOT!! Whoa, Izzy, I just checked it out…ANOTHER positive find, can’t wait to hear more when you’re in town next week. “Translating online fun to real-world impact…Emerald Island is a virtual world that belongs to kids; it is theirs to pioneer, prevail over and protect. But more than just a place or a game, Emerald Island is a story. When kids take part, they help Tamino, the game’s hero, save Emerald Island from the ravaging Pirats. 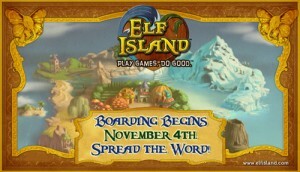 I’m adding this one to my post on Elf Island that launches in beta today! egad, I’m behind…I’ve gotta go VOTE too!!! eep! Update!!! Suneet just sent out a message and Dream Village did it!!! They WON! We are proud to announce that Dream Village has won the October Ideablob competition. Functionally, that means $10,000 in start-up funding. But of greater importance, the win means credibility and recognition for Dream Village. For example, we are in the process of confirming a formal check presentation at Wharton for this Friday, during the Net Impact Conference. We simply cannot say this strongly enough: this win, this victory, would not have been possible–not even fathomable–without a passionate support network of friends and family. You advocated for us. You rallied support for our project in what Ideablob has said was their most competitive competition to date. You gave our vision and our organization, momentum. You deserve our most heartfelt thank you. We are also in the process of looking for equity investors. Dream Village is a for-profit social enterprise, which means we believe we can build “the perfect business plan”, one that does well by our employees, investors, and the causes/charitable organizations we will support. This is an opportunity for you to rethink how you “give” and how you invest. One last thing…we found a partner through this Ideablob contest who’s actually running again this month. If you have a moment, vote for Kiba Kiba Books. Remember, you don’t have to register this time! Phew! Amy!!! Thanks so much for helping us out, for this lovely post, and for letting folks know how we did. One of the best parts of this entire process has been meeting folks like you, with a genuine interest in “doing good”. I look forward to working with you/working together. Let me know when you want to do that interview.